Tucked away in the historic Faubourg Marigny, but just minutes from the French Quarter, River House New Orleans feels like a secret hideaway. Our listing encompasses three separate apartments that are a magical mix of meticulously curated antiques, retro furnishings and contemporary amenities that lend a boho chic feel to each of the luxurious apartments in this boutique guest house. Whether you’re a couple looking for a private getaway or a family looking to spread out in your own fully equipped apartments, this luxurious antebellum mansion is designed to delight your senses. Located on an historic, tree-lined street just three blocks from the French Quarter, River House offers luxury accommodations on par with those found in fine hotels, but in the practical and more personal setting of an ideally situated independent residence. Tastefully designed with high quality furnishings and fine antiques, each one of River House’s three floors comprises a private, generously appointed vacation accommodation in its own right, while also offering the flexibility of being combined with one or both of the other floors for larger groups and extended stays. Completing the picture are a 500-square-foot westward-facing balcony, with original cast iron and spectacular cityscape views, and lush gardens surrounding the entire “compound” with swimming pool. * Fully licensed by the City of New Orleans. * Lovely private courtyards and swimming pool shared by all guests. * Unlimited wireless high-speed Internet. * HD flat-panel plasma TVs and digital cable TV with HBO and Showtime. Home theater/audio surround-sound systems with iPod docking stations and CD players. * Freshly ironed, high-thread-count 100% cotton bedding, down pillows, and King-size Serta Perfect Sleeper mattress. * Selection of coffee makers, including French press, Nespresso Le Cube One-Touch Espresso maker, and Keurig's with selection of blends for your personal daily use. * Antique-style pedestal sink and tub, Armoire fully stocked with plush cotton towels and robes. Washer dryer in unit along with an ironing board. * Concierge, maid and floral services available. * The River House Promise: We believe it is important to find the perfect home away from home. In designing River House, our goal was to create the vacation rental accommodations of our dreams--the kind of place we would like to stay in ourselves--a comfortable environment that not only rejuvenates the body but also inspires the mind and nourishes the soul. Stocked with basic amenities upon arrival. Nespresso and a Keurig in each apartment with complimentary pods. HD flat-panel plasma TVs and digital cable TV with HBO and Showtime. Home theater/audio surround-sound systems. Bike Rental business located on same block. Only our first floor apartment is accessible via a ramp or two easy steps. Motorized wheelchairs or Scooters may be left in entry to recharge. 18 foot diameter pool with large deck. Beautiful home in great location. Beautiful 3 story home in the Marigny neighborhood. Close to the river and Frenchmen Street. 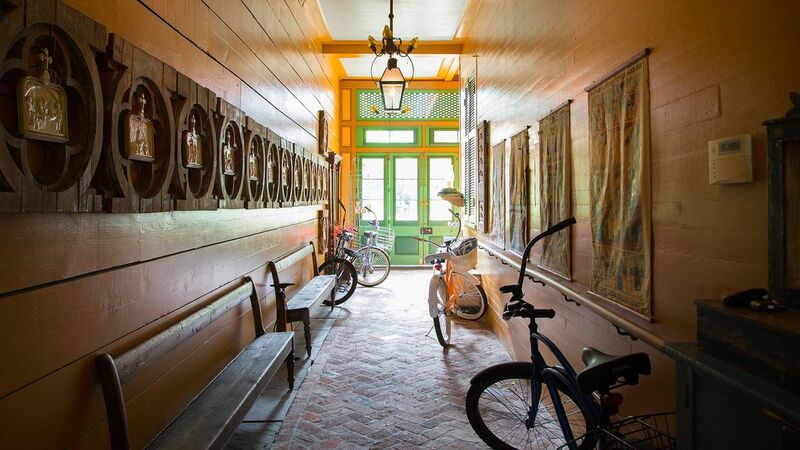 Easy walk to the French quarter or Bywater. Nice covered balcony on the street side & a wonderful private courtyard in back with a pool. Loved our visit. A lovely place with no detail spared. We had a fantastic stay at Faubourg Marigny. The apartment was beautifully furnished with all the conveniences and luxuries one could want. It's in a great location - close enough to walk to everything but far enough away to be quiet. Stay here if you can ... we'll be back! Loved this cute apartment. We were very impress with the size and true French Quarter style of this apartment. So happy the fridge was stock with a few waters and sodas and the pantry had a few snacks. This was a perfect distance from Frenchmen St and the French Quarter. We really felt like we lived in New Orlens and weren’t just tourist in a hotel. We will definitely stay here again. Thank you for your excellent review. We appreciate you as a guest and look forward to your next stay at River House New Orleans! My wife and I just returned from a one week stay at this charming house with it's beautiful decor and artwork.Staying here really allowed us to experience the true spirit and culture on New Orleans ! Everytime we returned it felt like we were coming home. The location as listed is perfect - 1 block to Frenchmen St for great food and entertain and just a short walk to the Quarter. The Garden Apartment was very spacious and incredibly well stocked with everything you would need to enjoy your stay - and then some !! The private pool / courtyard was always clean, well maintained and very nicely lit up up at night - very peaceful !! Finally what can we say about Csaba - a kind hearted and gracious host - a great Ambassador to the City of N.O....went out of his way to ensure everything was seamless ! Would definately reccomend the River House to anyone looking for an authentic New Orleans vacation - we can't wait to return !!! A most remarkable apartment in a great location with hosts who cannot do enough for you. Do yourself a favour, stay here! French Quarter, Preservation Jazz Hall, Audubon Aquarium, Upscale shopping, Convention Center, and Casino are all within walking distance. Also music and theatre venues, The Joy, Civic, Saenger, Orpheum, and Mahalia Jackson are nearby.